FILE - This photo shows damage inflicted upon a hospital in Kunduz, Afghanistan, by a U.S. airstrike Oct. 3 that killed 22 people. The United States will offer "condolence payments" for those killed or injured in the U.S. airstrike that mistakenly hit a Doctors Without Borders hospital in Kunduz, Afghanistan, October 3. Defense Department spokesman Peter Cook said that U.S. forces in Afghanistan will work with those affected to determine appropriate payments. If necessary, the administration will seek additional authority from the Congress, he said. Earlier, Cook said the amount of the payments has not been determined. The money will go to "civilian non-combatants injured and the families of civilian non-combatants killed as a result of U.S. military operations," he said. The medical group, known by its French acronym MSF, has said the airstrike killed 10 patients and 12 MSF staff members. The charity said Thursday that 33 people are still missing, including nine patients and 24 staff members. 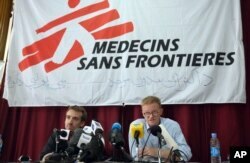 The general director of medical charity, Medecins Sans Frontieres (MSF), Christopher Stokes, right, talks as MSF's Country Representative for Afghanistan, Guilhem Molinie, left, listens, during a press conference at their office, in Kabul. MSF ended its Kunduz operations after the aerial bombardment and has demanded an independent investigation into the attack under the Geneva Conventions. The group says probes under way by the U.S., Afghanistan and NATO are insufficient and has suggested that the attack amounted to a war crime. The Geneva Conventions are a set of international treaties and protocols regulating the conduct of armed conflict and aim to protect people not taking part in hostilities and those who are no longer doing so. U.S. President Barack Obama apologized Wednesday to the medical group's president, Dr. Joanne Liu, for the attack. However, the details of U.S. involvement in the attack are murky since the U.S. has changed its account of what happened that day. The U.S. says it will not provide further details about the incident while its military conducts an investigation. In this photograph released by Medecins Sans Frontieres (MSF) on October 3, 2015, Afghan MSF surgeons work in an undamaged part of the MSF hospital in Kunduz after the operating theatres were destroyed in an air strike. White House spokesman Josh Earnest said Obama called Liu to "apologize and express condolences." "In this case, there was a mistake and it's one that the U.S. owns up to," Earnest said. He said Obama "is very eager to get to the bottom of what exactly occurred." Obama also called Afghan President Ashraf Ghani to voice his condolences for the innocent loss of lives in the incident, the spokesman said, and to commend Afghan forces for their bravery in the fight to control the northern Afghan city in clashes with Taliban insurgents. Meanwhile, U.S. officials are probing whether the military exceeded its authority for use of force in Afghanistan in launching the airstrike. The top U.S. commander in Afghanistan, Army General John Campbell, says the United States is taking the blame for carrying out the raid after Afghan forces requested it to attack Taliban insurgents it believed were firing from inside the medical facility. But the question remains whether the U.S. should have agreed to the attack. 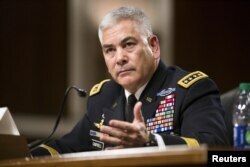 U.S. Army General John Campbell, commander of the Resolute Support Mission and United States Force - Afghanistan, testifies before a Senate Armed Services Committee hearing on "The Situation in Afghanistan" on Capitol Hill in Washington, Oct. 6, 2015. When Obama ended American ground combat operations in Afghanistan last year, he said that the residual force of 9,800 U.S. troops remaining there should focus on training and advising Afghan troops. He limited the use of force to three circumstances: the defense of U.S. and allied troops, support for missions targeting remnants of al-Qaida insurgents in Afghanistan, and assisting Afghan troops facing mass casualties in extreme situations. It is not clear whether the U.S. bombing of the hospital met any of those criteria. Campbell told a congressional committee the hospital was "mistakenly struck" and the United States "would never intentionally target a protected medical facility." He said he has ordered American forces in Afghanistan to be retrained on their use of force. Afghan forces have been trying for several days to regain full control of Kunduz in the northern part of the country after Taliban insurgents briefly seized it last week. VOA's Ken Bredemeier contributed to this report.